There is nothing new in the following design, excepted perhaps later improvements. It is a rotor with secondary turbines under a lifter. The electric transmission allows reaching really high altitude. The main rope is motionless in order to avoid a too big wear and protect the electric cable. The lifter is also a supplementary safety in the case of computer failure. The rotor allows a constrained figure being not exclusively dependent on the computerized control. The rotor scalability can be a concern but rotor blades for autogiro or helicopter have higher aspect ratios than aircraft wings, and are far lighter. Then suspension lines reduce loads. Critics and observations are welcome. is developing - and actually already flying. Since they do not have a force vector from the lifter they do need active pitch control though. Blades tips energy, a French company based in Grenoble try to do that since 5 years but without a lifter. I don’t think that could work without a lifter anyway. I know the guy, Rogelio Lozano. They already began to pivot 1 year ago to do a radio transmission tower. Might be not convincing enough to go on power production as it is a clissical pivot. Zéphyr solar, a helium solar ballon did the same thing 1 year ago. Turbines in the tip of blades take faster apparent wind and can be smaller. I don’t think that centrifugal force is so important in regard to wind force, at least as the rotor scales. So a relatively rigid construction can be better. IMHO http://bladetipsenergy.com is developing a good concept that could be suitable as an AWES. 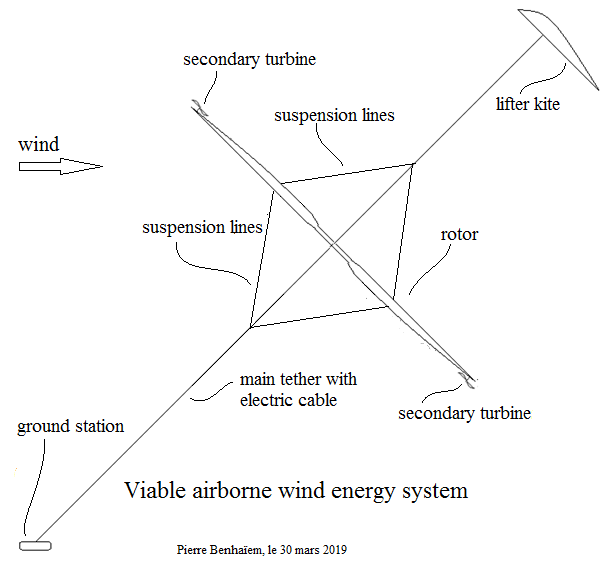 For that some possible improvements are a higher aspect ratio of the blades, the secondary turbines in their tips, adding suspension lines or bridles to counter the bending moment of the blades, and a lifter. After there are some interesting possibilities.